Do you want to update the flooring in your home with brand new ceramic tile? Our flooring store sells a variety of top-notch ceramic floor tiles in a variety of colors to suit many styles of decor. Whether you prefer bright and vibrant tones or something a little more subtle, like earth tones, you’re sure to find what you need to make over your floors when you shop with us. Whether you plan to add ceramic tile flooring in one room or all throughout of your living spaces, you’re sure to benefit from all of its aspects. Its ease of maintenance is easily one of its most attractive qualities. Messes and spills are problems of the past once you install ceramic tile flooring. If you choose to have your ceramic tile glazed, its dense body permits little to no moisture accumulation. All you need to clean up any spill is a mop and some household cleaning solution. Not only can tile be used on floors, but it can also be used in bathrooms, kitchens, hallways, and walls. Its resistance to fire also makes it a perfect application for countertops. If you set a scolding, hot pan down on the counter you won’t have to worry about your countertops melting or getting scuffed. Mix and match different colors, textures, and patterns to create a unique and fresh backdrop for any kitchen or living space. 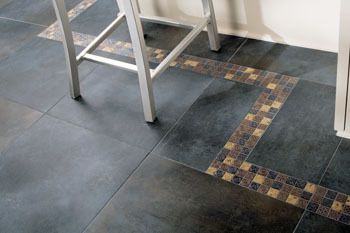 Lastly, tile’s extreme durability makes it one of the most widely regarded flooring options on the market. Its ability to withstand the wear and tear of daily foot traffic makes it ideal for homeowners with small children and pets. As long as tile floors are cleaned regularly and well-maintained, they can last up to 50 years, if not longer. Our associates are always ready to lend a helping hand when it comes to your project. When you visit our store with an idea, we’re more than happy to help flesh out your idea to create a plan of action. Once you figure out what concept you want for your property, we’ll show you all the materials and tools you need. Everyone in our flooring store is committed to the success of your project. Being a locally owned and operated flooring company, we are dedicated to the continued success of our community. Glass, sand, and clay are natural materials that are all used to make ceramic tile. These types of materials help support a healthy environment for your property. Tile doesn’t attract dust, which means you have less dust in the air. Less dust in the air reduces the amount of allergens in the air and makes your home healthier. It is an excellent choice for those who suffer from dust-related allergies or who have constricted airways due to breathing conditions, such as asthma. Along with being an environmentally friendly option, it also helps you save money. Areas where the weather is hot and humid for many months out of the year require the constant use of an air conditioning unit. A tile floor made of ceramic helps reduce your energy costs each month because it helps cool your home during the summer months. Additionally, during the winter months, it also helps retain a little bit of warmth. After you’ve decided which tile you want in your property it’s time for the installation process. When you’re ready to install, rely on our skilled and certified installers to do the job properly. Our staff of installation experts is highly trained and has successfully completed the installation of all types of floors, including tile, hardwood, laminate vinyl tile, and carpet. Having a professional ensures that the job is done right and efficiently. If you let someone without the proper knowledge and expertise to install your floors, there’s a chance steps could get overlooked that will require maintenance later on. At best, the problem can be fixed easily. At worst, the floors would have to be replaced. Save yourself the trouble and feel confident when one of our professionals handles the work for you. We proudly serve the communities of Beaumont, Orange, Port Arthur, Nederland, Port Neches, Groves, Sour Lake, Lumberton and Kountze, Texas.